The event was the first in a series of many planned to mark the 550th birth anniversary of Guru Nanak. Strains of soothing, devotional music filled the AMP Auditorium in North Bethesda, Maryland, this past Saturday. The evening of Gurbani, or Sikh devotional music, was strung together by the lilting tunes of Bhai Baldeep Singh and his team of musicians, who presented mystical hymns. The occasion was the celebration of the 550th birth anniversary of Guru Nanak, founder of Sikhism. The event was organized by Embassy of India, in association with many Sikh Organizations and gurdwaras based across the country. 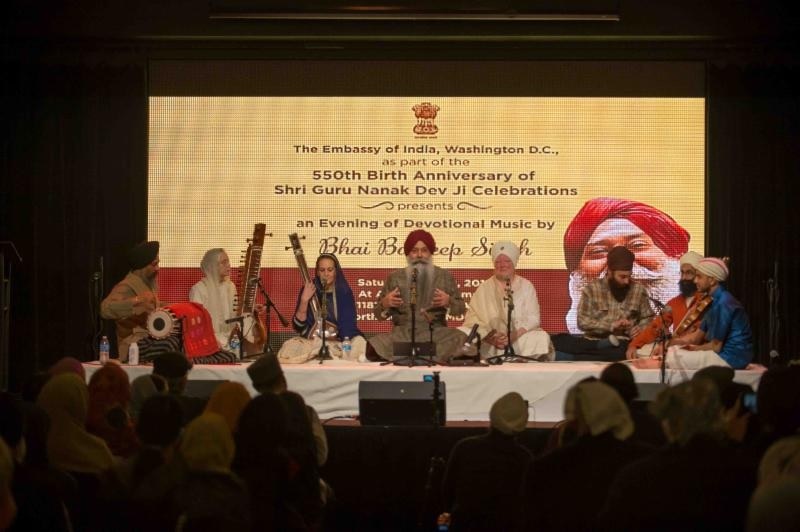 The audience, comprising members of the Indian community, media, think-tanks and local government officials, was both moved and inspired by the religious music. The event was the first in the series of many planned to mark the occasion of the 550th birth anniversary of Guru Nanak. Speaking on the occasion, Ambassador of India to the United States Harsh Vardhan Shringla, highlighted many important steps that have been taken by the Government of India to mark Guru Nanak’s birth anniversary. The development of Kartarpur in Gurdaspur District of Punjab, the development of Sultanpuri Lodhi as a heritage town and establishment of a center for interfaith studies, and Guru Nanak Dev University are among the prominent ones. While praising Guru Nanak’s teachings and how relevant they are in current times, the ambassador said that Guru Nanak traveled far and wide to spread the message of God and found an egalitarian faith. The ambassador also highlighted the role of the Sikh community in the United States. He told the gathering that the embassy and the Indian consulates across the country have planned a calendar of activities such as concerts, seminars, and interfaith events throughout the year to mark Guru Nanak’s birthday.